Drawing and Planning have successfully secured planning permission for Roof extension involving the replacement of existing crown pitched roof with mansard roof incorporating front and side dormers and rear dormer windows with Juliet balconies and roof lights to facilitate a loft conversion to provide bedrooms in the roof space. Project : Roof extension involving the replacement of existing crown pitched roof with mansard roof incorporating front and side dormers and rear dormer windows with Juliet balconies and roof lights to facilitate a loft conversion to provide bedrooms in the roof space. 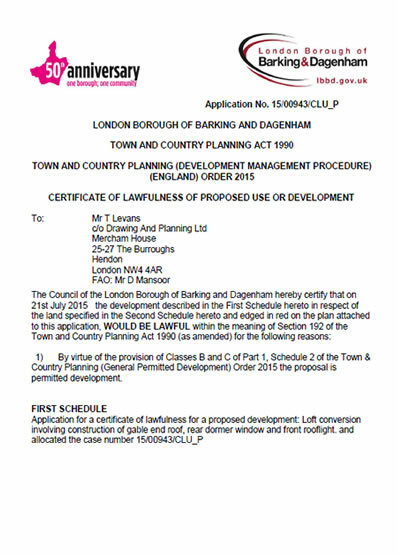 Application for a certificate of lawfulness for a proposed development: Loft conversion involving construction of gable end roof, rear dormer window and front rooflight. 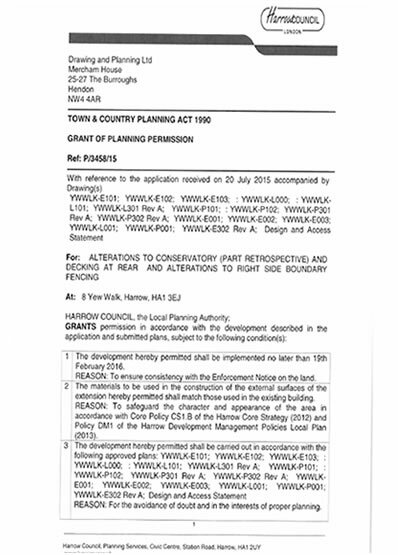 Drawing and Planning have successfully secured planning permission for Erection of rear dormer to facilitate a roof extension and insertion of 3x front rooflights and 2x rear rooflights to first floor flat. Project : Erection of rear dormer to facilitate a roof extension and insertion of 3x front rooflights and 2x rear rooflights to first floor flat. 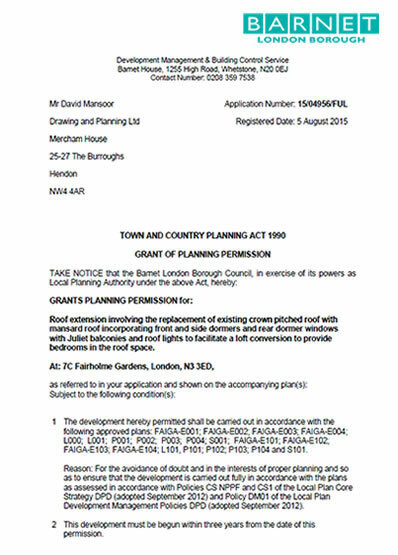 Drawing and Planning have successfully secured planning permission for alterations to conservatory (part retrospective) and decking at rear and alterations to right side boundary fencing. Project : Alterations to conservatory (part retrospective) and decking at rear and alterations to right side boundary fencing. 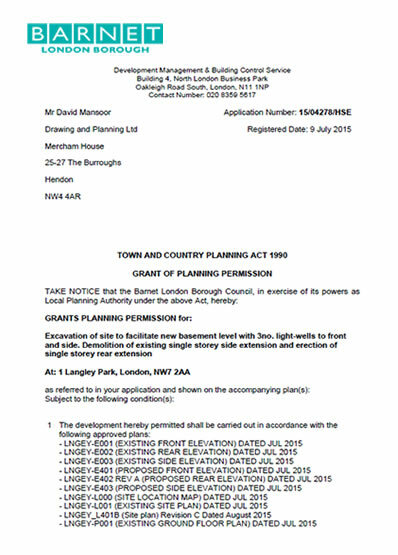 DAP Group have successfully secured a certificate of lawfulness for a proposed use of a room as an office by the occupants of the house. 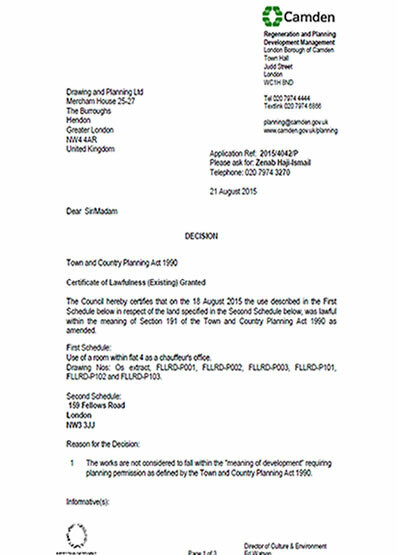 Project : Certificate of lawfulness for a proposed use of a room as an office by the occupants of the house. 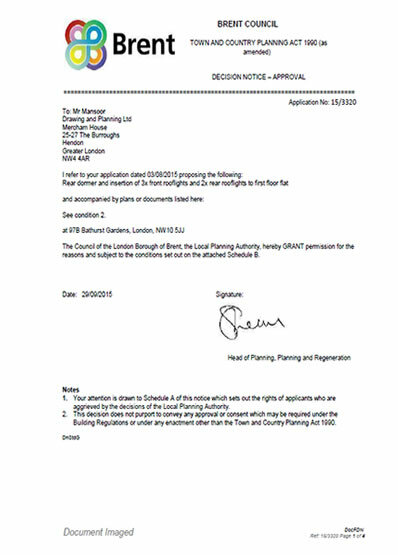 Drawing and Planning have successfully secured planning permission for Excavation of site to facilitate new basement level with 3no. light-wells to front and side. Demolition of existing single storey side extension and erection of single storey rear extension. Project : Excavation of site to facilitate new basement level with 3no. light-wells to front and side. Demolition of existing single storey side extension and erection of single storey rear extension. 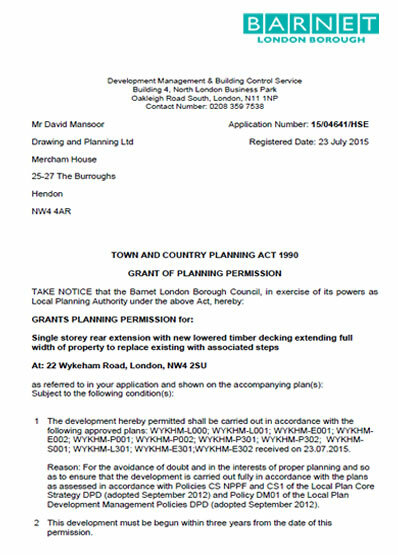 Drawing and Planning have successfully secured planning permission for Single storey rear extension with new lowered timber decking extending full width of property to replace existing with associated steps. Project : Single storey rear extension with new lowered timber decking extending full width of property to replace existing with associated steps.